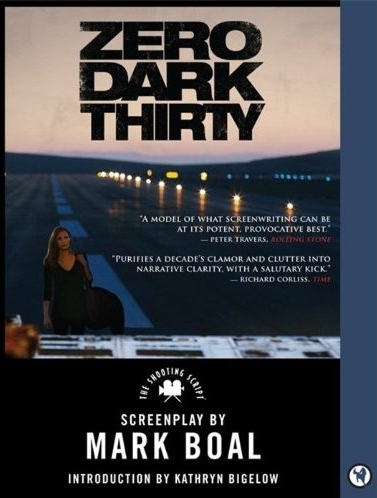 Mark Boal’s Oscar-nominated screenplay for Zero Dark Thirty has recently been issued in paperback book form by Newmarket Press, an imprint of HarperCollins. It’s a slim but valuable volume, an excellent resource for anyone who wants to see how the screenwriter’s work looks before visualized by the filmmakers. A brief introduction by the film’s director Kathryn Bigelow precedes the actual screenplay, formatted in standard Courier font. There’s no annotation, just the screenplay itself. For anyone unfamiliar with how a movie “reads” before it is produced, the sparse, dialogue-dominated style may be surprising. It’s the blueprint for what eventually becomes a movie, and as such it presents a reading experience considerably different from novels. Published screenplays such as this are particularly useful for aspiring screenwriters as a model for how to conceptualize what will translate into visuals. Boal’s style is incisive, compelling the writer to keep turning pages. Following the body of the actual screenplay, there’s a substantial interview that Rob Feld conducted with Boal. They cover a number of aspects of the process, including Boal’s research in adapting real-life events (especially in the case, with something as controversial as the story of the hunt for Osama Bin Laden). A selection of storyboards is included after the interview, further illustrating the transition from script to screen. Midway through the book, there’s a section of full color production stills from Zero Dark Thirty.